Thanks to some judiciously placed sandbags and a selection of pumps and a great deal of effort from all concerned the water had dropped from the peak of a couple of days ago (marked by the white line) to todays level. It migh not seem much but the water is no longer lapping at the doors of the four houses in Shirnall View and hopefully this level can be maintained while the flooding continues. Lee, from the Housing Association support services, has been working long hours, assisted and fed by the Shirnall View householders. With a variety of pumps they have managed to drop the level sufficiently to prevent any immediate threat of water entering the houses. 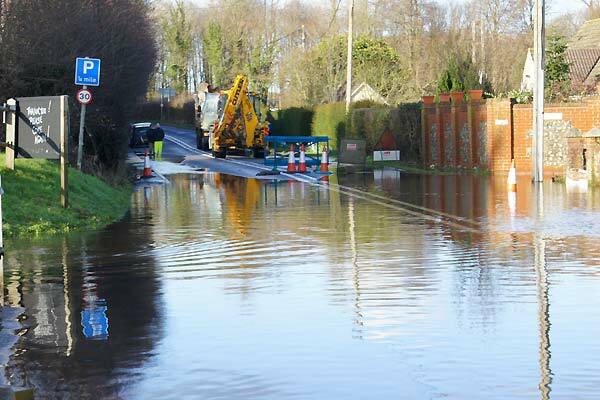 Thanks to a combination of sand bags and pump, other householders along Gosport Road have managed to keep the water out assisted by the Highway Authorities who had a number of personnel on site when this photo was taken(11th Feb.). 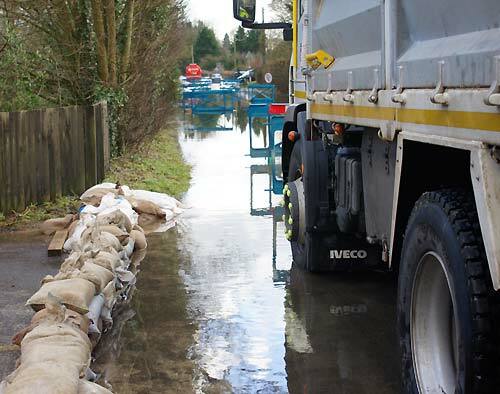 No more houses have been flooded but it has been a close run thing for a number of residents, who have been busy laying sandbags and pumping out water to protect their properties. 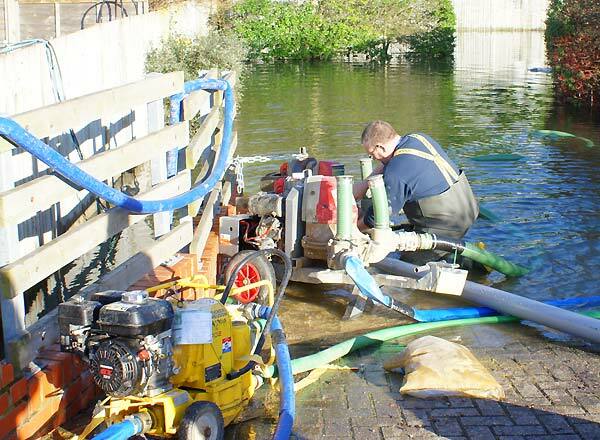 On the Alton side of the crossroads there is another lake of water across the main road in front of the Golden Pheasant car park The vehicles in the background were unloading pipe sections which were connected to a large pump which began operating on the day after this picture was taken. 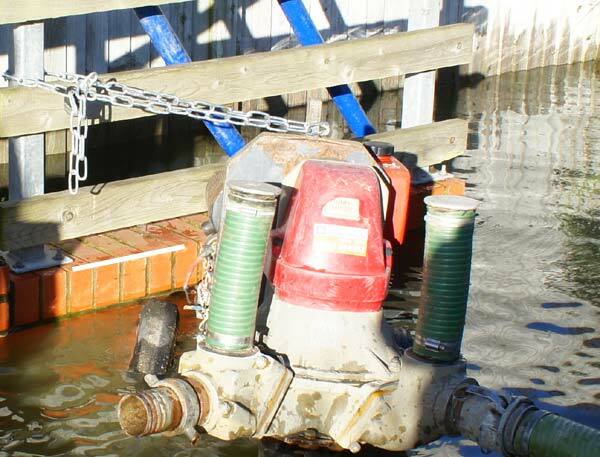 The ioutput from this pump has stabilized the level and reduced the risk of any further houses flooding in the Village. 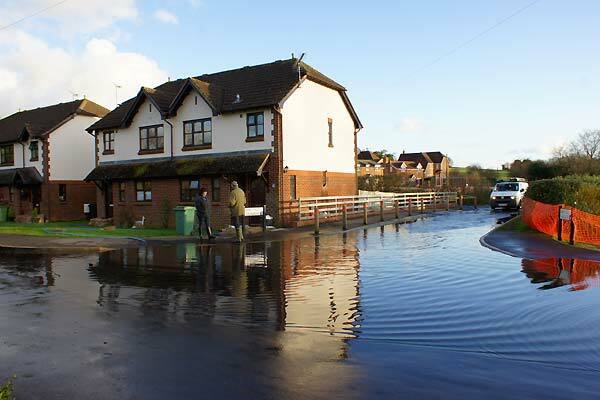 This will be good news for those whose homes are threatened by the flood water. The Gardens behind Lillian place have been flooded for some time and the water in the low lying gardens is much deeper than in the main road. One bit of good news is that the Pub is not at risk from the current problems and currently access is possible without the need for waders, although wellies are essential footwear from the Northern side. 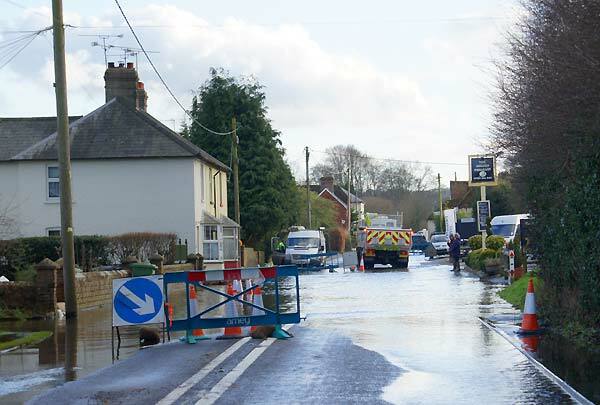 Although access to Brightstone lane is still open there may be a lot of water in the road and if you are headed in that direction please drive carefully to avoid sending a wave of water into the houses. With some rain forecast over the next week or so Farringdon residents will be keeping a careful eye on the water levels along Gosport Road.. The picture below is a collage of three pictures taken at various dates over the last few days and gives some idea of how the water levels have risen in the area since the beginning of the month.